Whether you're going to the airport or a white tie event, we get you there on time and in superior comfort. 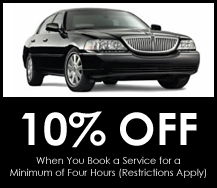 Learn more about our town car and limo services. When you have a large group, make sure everyone is accommodated by chartering one of our entertainment/sleeper coach buses. Dewalt Limousine provides you with a variety of vehicle options for transporting a large group, all with features and amenities that are second-to-none. a service for entertainment transportation. Awards: Fully Licensed by Public Safety Commission & the Atlanta Airport. Expect to be catered to with the highest class of service with luxury transportation from Dewalt Limousine in Atlanta, GA. Offering limo and entertainment services for your wedding, prom or airport taxi. We consider the provision of water and soft drinks a matter of fact, and ensure you travel in a clean and commodious vehicle every time. We can travel across all of the United States and Canada! You'll always appreciate the courtesy and professionalism of our drivers, who are fully licensed, insured, and bonded. They dress in a suit and tie, and provide assistance with your luggage as well as anything else you need.